Raptor DSLAM delivers the next generation of high-performance business and residential DSL services. With Raptor, carriers can offer digital video, high bandwidth Internet access and cell relay services from a single platform. Raptor is the only DSLAM a carrier needs for deployment anywhere in their network. It supports ADSL2+, VDSL2, and SHDSL loops with ATM, IP and Ethernet uplinks for legacy, overlay and green-field deployments. 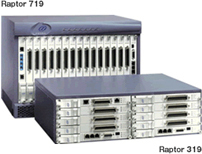 Raptor allows carriers to deploy the same chassis in CO and Remote Terminal sites in both 3-U and 7-U configurations.